CNN: Look at Trump’s ‘Most Awkward’ Handshake Ever! Trump is really the straw that stirs the drink in the picture. Or, more accurately, the guy in the middle of the photo who doesn’t totally get how to do the handshake and is pulling everyone in the picture in weird ways as a result. On Trump’s left, he appears to have wedged Phuc’s entire hand between his index and middle fingers — and the grip is slipping. On his right, Trump is on the verge of meeting hands with Philippine President Rodrigo Duterte. 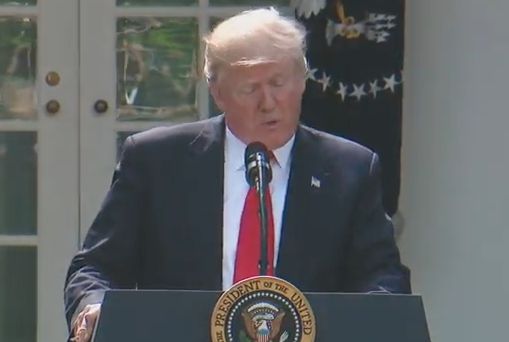 The look on Trump’s face is somewhere between “I am having fun? 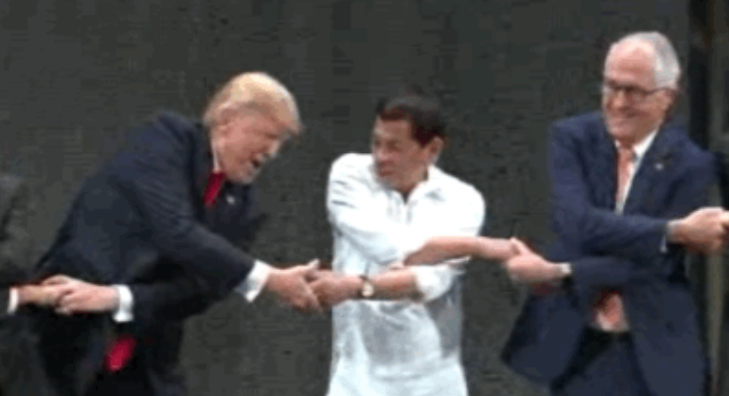 !” and “This is harder than it looks!” Rest assured, however, the handshake was consummated — although with a bit of right arm straining by Trump. Meetings of international leaders do lead to photo ops and some awkward situations, but for CNN to spend time analyzing his handshake may be time best used elsewhere.